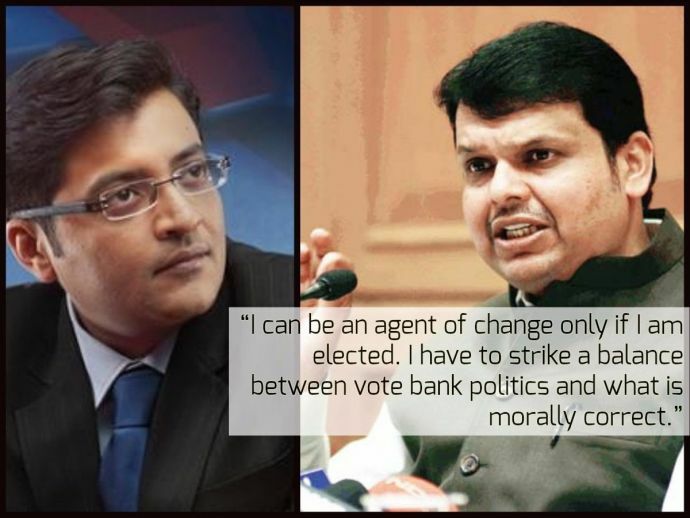 The Fiery Arnab Goswami Interviews CM Devendra Fadnavis, And The Nation Needs More Such Exchanges! "You'll never allow me to dodge [the question], so I think I'll attempt it," said the CM to the refreshingly blunt Goswami. Celebrated journalist Arnab Goswami, who will return to television with his new venture, Republic, in 2017, moderated a discussion with Maharashtra CM Devendra Fadnavis on Monday. The conversation was part of the launch of the Transform Maharashtra initiative at Mood Indigo, the youth fest at IIT Bombay. In a lively tete-a-tete replete with contentious questions, earnest replies, “the nation wants to know” and Rahul Gandhi jokes, the Frankly Speaking journo grilled the chief minister on various issues like vote bank politics, reservation, and nepotism in government. The CM, on the other hand, played safe and gave politically correct replies for the most part, albeit explaining why, in his position, it was necessary to be diplomatic and seek middle ground on controversial topics. Digs on politicians as well as Arnab’s confrontational style, flew both ways throughout the interview. The house was then opened for questions by the students, whose queries to the duo also set the stage for the opening address for the Transform Maharashtra initiative, which invites participation from youth in governance. The project seeks the involvement of young minds to address 11 critical challenges faced by Maharashtra via policy changes.